Its a great aircraft, powerful, stable, twice as fast as a Frog and goes over six times as far. Thats Lieutenant General. John G. Castellaw, the Marine Corps Deputy Commandant for Aviation, comparing the new Bell/Boeing MV-22 Osprey tiltrotor to the 40-year-old Boeing CH-46 Frog. More than 20 years after beginning development, and seven years after a spate of crashes that killed 30 people, the $130-million-per-copy Osprey is finally prepping for its first combat deployment. One of the Marines two operational squadrons will head to Iraq or Afghanistan sometime this year. Meanwhile, deliveries continue to the Marines and the Air Force, with more than 50 aircraft in service against a planned total of 410.Despite the Osprey programs advanced state, critics are still calling for its cancellation. 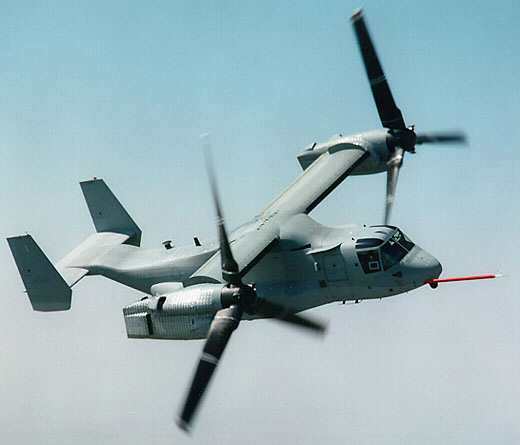 None have been more vociferous than the wonks at Center for Defense Information in Washington, D.C. On January 18, freelance writer Lee Gaillard presented his CDI-backed report V-22 Osprey: Wonder Weapon or Widow Maker. This glitch-plagued program is poised to reveal fundamental flaws that may cost even more lives. * Lacking guns, its vulnerable in hot landing zonesMany of these flaws were revealed in the militarys operational evaluation that wrapped in 2005. Still, the Pentagon cleared the Osprey for service. Gaillard chalks this up to unstoppable political momentum resulting from the Bell/Boeing team lining up contractors in 45 out of 50 states.Of course, the military contests Gaillards claims. It says that after the bugs were ironed out, the Osprey not only works its revolutionary.I'm on the fence. On one hand, Ive been around long enough to know that defense contractors sometimes lie and that the Pentagon sometimes lets them get away with it. On the other hand, last year I heard a similarly scathing CDI brief on the Lockheed Martin F-22 Raptor fighter jet, a brief that didn't really match with what I saw, once I had paid a visit to a Raptor squadron to see for myself. So while the documents Gaillard offers as proof military evaluations, Government Accounting Office reports (PDF! ), etc. I'd like to make up my own mind, thank you very much. In this series, I'll try to nail down: Is Osprey right for emerging missions in the Long War?